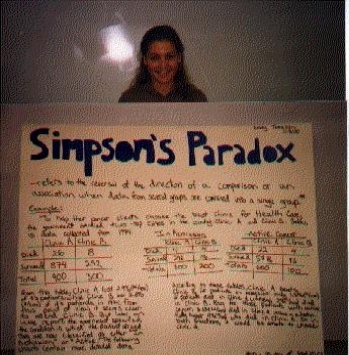 Emily's project illustrates Simpson's Paradox, which refers to the reversal of the direction of a comparison or an association when data from several groups are combined into a single group. Emily's data, which might not show up well in the picture, compares two clinics. The chart on the right in the picture has this data. Clinic A lost 2.89% of its patients and Clinic B lost 2.67% of its patients. In the two categories that make up the total, Clinic B loses a greater percentage of its patients than does Clinic A. Check it out!